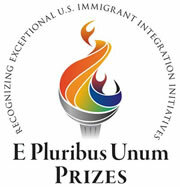 The E Pluribus Unum Prizes were established in 2009 to help others learn more about important work and to honor the efforts of those who are creating stronger, more unified and successful communities by strengthening relationships between native-born and foreign-born Americans, and by helping immigrants and their children to succeed in the United States. Sponsored by the Harvard Kennedy School of Government's Ash Institute for Democratic Governance and Innovation, the award acknowledges creative approaches and solutions to problems in the public sector. Earmarks are funds provided by the Congress for projects, programs, or grants where the purported congressional direction circumvents otherwise applicable merit-based or competitive allocation processes, or specifies the location or recipient, or otherwise curtails the ability of the executive branch to manage its statutory and constitutional responsibilities pertaining to the funds allocation process. DISCLAIMER: The Welcome Back Initiative only offers services in the United States.